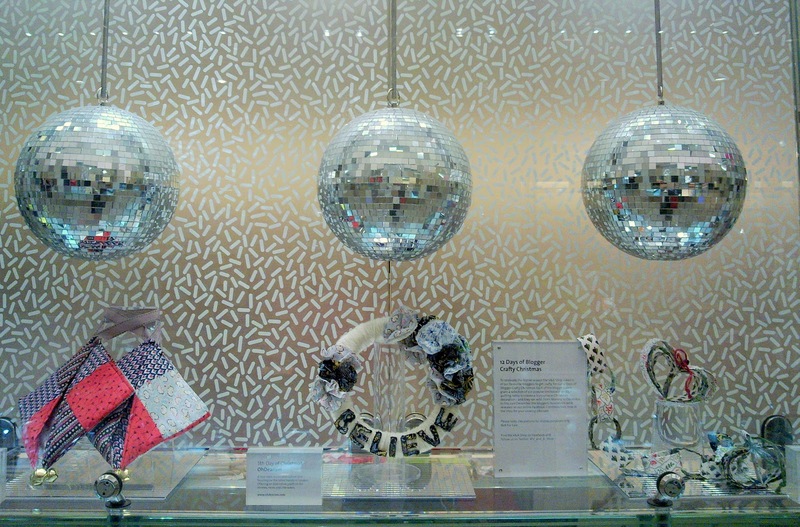 My decorations on display at the V&A shop! This year has got off to a good start. 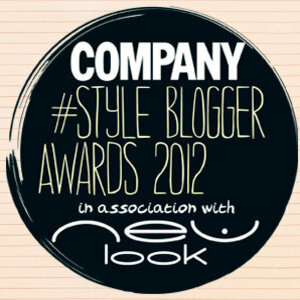 Not only am I nominated in the Company Style Blogger Awards 2012 (please vote for me! ), the decorations I made for the V&A's 12 Days of Blogger Crafty Christmas went on display at the V&A gift shop earlier this month. I went along last week to see all the decorations made by everyone else who took part, but sadly the exhibit had just ended. However, the V&A had kindly taken some pictures, so here's my creations on the right, next to Kit from Style Slicker's quilted masterpieces and a cute wreath by Natalie and Rosie from OhDearism. Want to see how we made them? Click here, here and here to find out. And, if you fancy giving it a go, the V&A fabrics are 50% off online at the V&A shop with sale prices from £4.25 to £7.50 for cut-to-order metreage. You've got plenty of time before Christmas comes around! 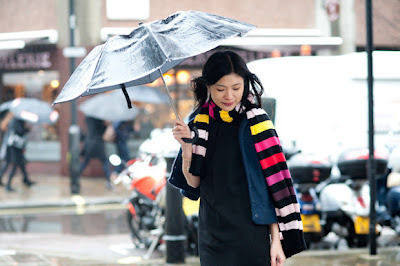 It was such a wet and miserable day last Tuesday that I decided to give my colourful Sonia Rykiel for H&M scarf its very first outing. Yes, I'm ashamed to admit it's been left in a drawer since I went a little bit crazy at the launch of that particular collaboration (...back in 2010!). Guilt-ridden at my excessive spending, I hid all my purchases away and decided to ration myself to a new piece of Sonia a month (see my previous blog posts here, here and here). And, well, some pieces became favourites that I've worn time and again, while others - like the scarf - got forgotten about (I hid them well!). Then seasons changed and now, somehow, it's 2012, nearly two years on. Still, the bright colours are right on trend. Orelia bracelet - I like to wear it with the charms dangling down. Looks particularly elegant with a cocktail in hand! See what the rest of Team ELLE wore last week at ELLEuk.com's What ELLE Wears blog. Last season, Kurt Geiger branched out from footwear to launch an accessories collection called Everything But The Dress. As the name suggests, the range includes all the finishing touches your outfit could possibly need, from jewellery to bags and belts to hats, gloves and scarves. I've been eyeing up this debut collection all season long and the good news is, with the last week of the Kurt Geiger sale upon us, there's up to 75% off. Top of my wish list was this red perspex pouch which I snapped up for half price, reduced from £30 to £15. I love its minimal design and coloured transparency. It's a great alternative to the oversized slouchy clutch. If you're good at keeping your belongings to the bare essentials, this is for you. And the bonus is, you won't need to root around to find what you need. The perspex pouch also comes in black, pink and blue, although only the latter two are in the sale. 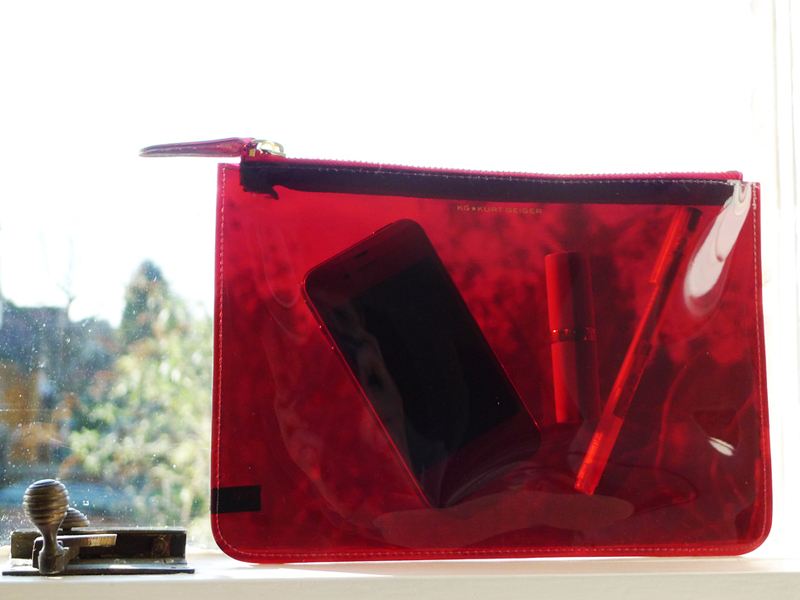 You can also get a matching purse with credit-card holder for £10, down from £20. 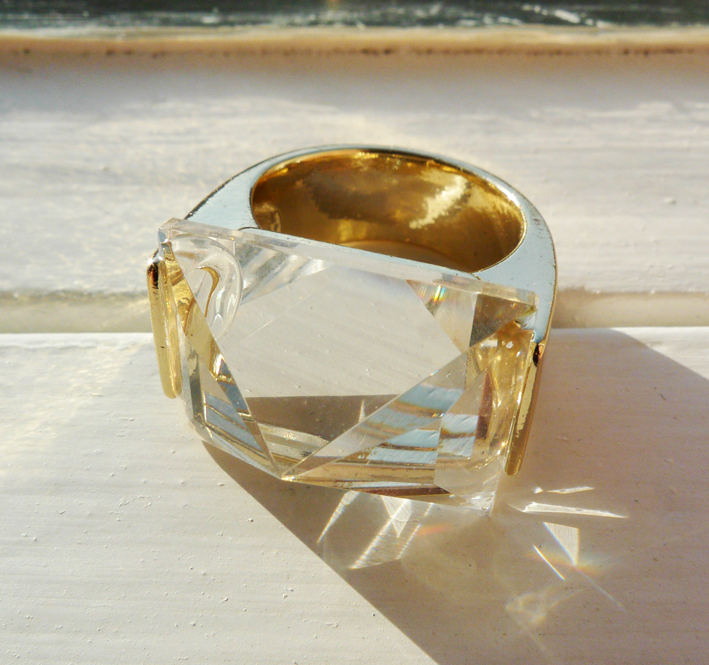 My second purchase was the Grace ring (below) for a tenner, reduced by 75% from £40. Its chunky, modern design makes for a cool, contemporary cocktail ring. It comes in a dark amber stone, too. And, if you want a bigger rock, try the Greta ring for £13 - it has a square stone as opposed to the Grace ring's rectangular one. Both are big enough not to be missed and catch the light beautifully. Oh, and Everything But The Dress is delightfully presented. The perspex pouch is sealed in a blingy gold Jiffy envelope while the ring comes packaged in a showy cube gift box. As the finishing touches to this collection reveal, every detail counts. I just can't keep away from the Orelia jewellery displays in Topshop at the moment. The fantastic sale bargains keep me going back for more. 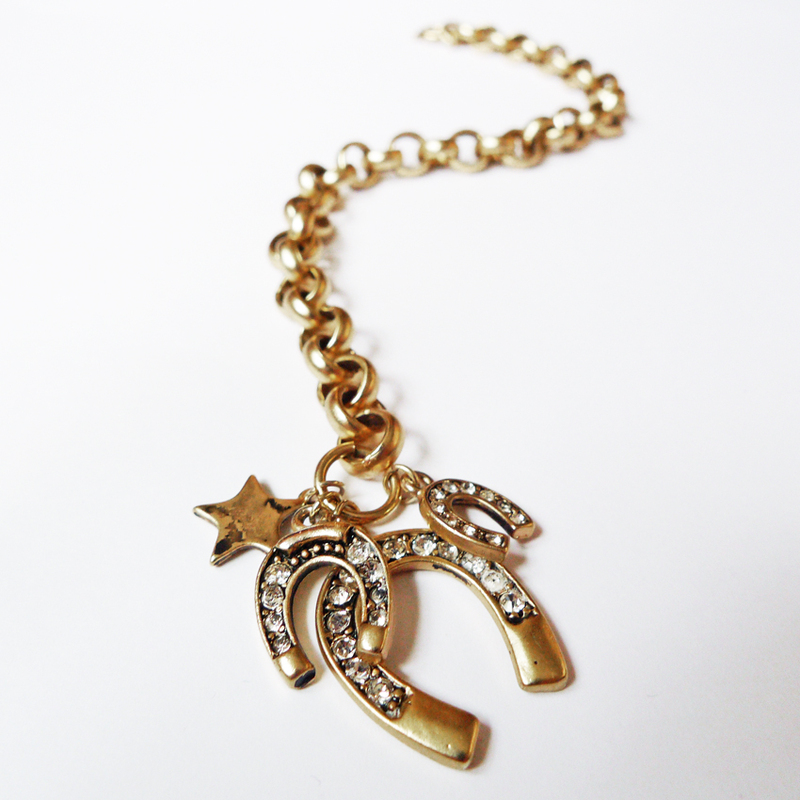 My latest find is this triple horseshoe bracelet for a mere £4, reduced from £18. I'm a sucker for charms and this trio of horseshoes made with Crystallized Swarovski Elements is particularly sweet. I love its vintage look and the chunky belcher chain, too. Like the swallow ring, I was so taken with it that I bought a second. This time, for a certain bride-to-be. I won't name any names as the gift hasn't yet been bestowed, but it's the most delightful good luck present, don't you think? On the subject of luck, I'm going to wear my Orelia bracelet as my lucky charm. It was Chinese New Year on Monday and the year of the dragon is meant to be very auspicious, so I'm hoping it brings lots of good things. First up, a win in the Company Style Blogger Awards 2012 would be nice. So please make my year and vote for me here. Thank you! ONCE UPON A TIME, there was a bag maker called The Cambridge Satchel Company and it produced, among other things, these amazing fluoro-coloured leather satchels. One day, a blogger with an eye for a bargain (let's call her Bargainista Fashionista) spotted one of these satchels in the Urban Outfitters sale (it wasn't hard to miss). She broadcast the news far and wide (through the medium of Twitter) and learnt that her friend Suz dearly desired one. Especially at that price: it was grandly reduced from £105 to £40. But word had spread too fast and by the time Suz went to buy her satchel, it was gone. Not one to give up, Bargainista Fashionista searched the length and breadth of the country to find Suz another bag and, a week later, a fluoro pop of pink winked at her in a different outpost of Urban Outfitters. United at last, Suz and her bag lived happily ever after. I love playing personal shopper. Obviously, spending other people's cash is fun, but saving them money is even more satisfying. Anyway, Suz kindly lent me her new satchel so it could be shot for ELLEuk.com's What ELLE Wears blog this week. Isn't it awesome? I love that The Cambridge Satchel Company has revamped a classic old-school design in fabulous fluoros. There's neon orange, yellow and green, too. You can even have your bag embossed with your initials. What colour would you get? I think fluoro orange is pretty cool. I'm a little obsessed with Orelia jewellery right now – especially as the sales are making its already affordable prices so very bargainous. 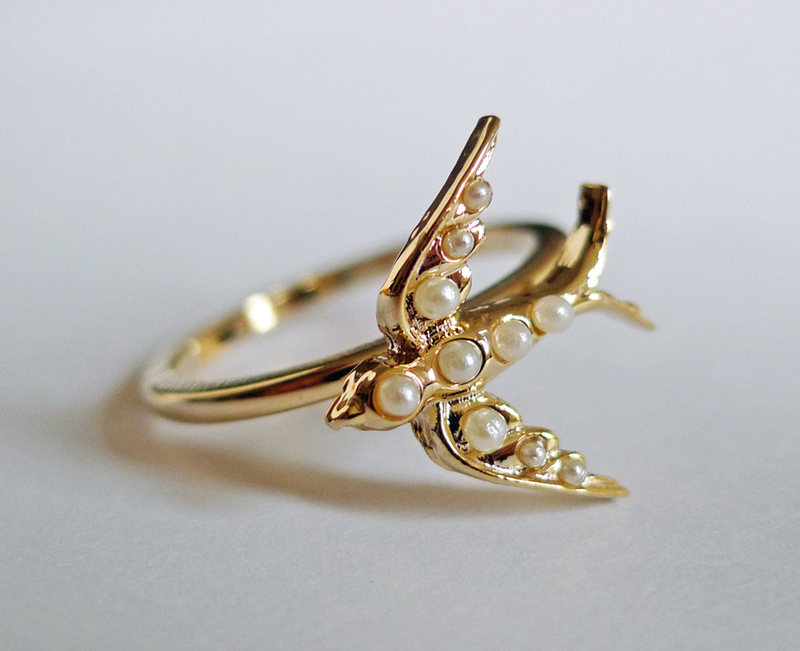 My favourite find is this swallow ring. It oozes vintage Victorian charm, albeit minus the 18ct gold and seed pearls. Still, I don't mind a bit of costume jewellery when a) it looks this good and b) it's just £4 – which this little birdy is, reduced from £15. In fact, at that price, it was hard not to buy more. So I did, snapping one up for my friend Hannah, who hearts swallows more than me, and a second for myself so I can wear them on adjacent fingers and have the two swallows gazing at each other. So pretty! Check it out now at Topshop – the Orelia sale choice is awesome. Happy bargain-hunting! Hot on the heels of Versace's successful collaboration with H&M in November (click here and here for my previous blog posts) comes its second line for the high-street giant: a pre-spring 2012 cruise collection which launches tomorrow. This time round, there's no need to camp outside stores as the range is available exclusively online from 9am. And, to ensure everyone gets a piece of Versace, purchases are limited to one of each item per person. I love the tutti fruity prints which adorn everything from dresses, bikinis and shorts to a bag, belt and ballet pumps. 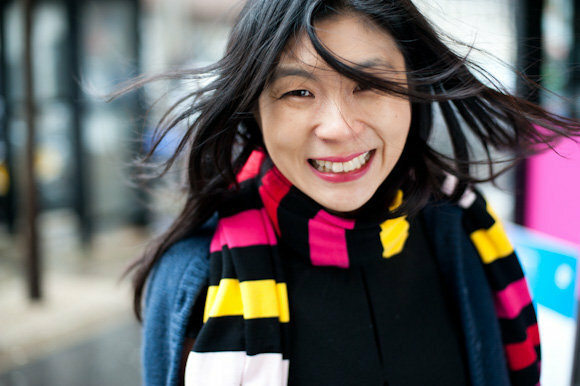 They're so fun and refreshing after this winter's sombre palette. The silk dress (above) is £59.99, while the silk blouse and cotton shorts (below) are £34.99 and £24.99. What will you be buying? 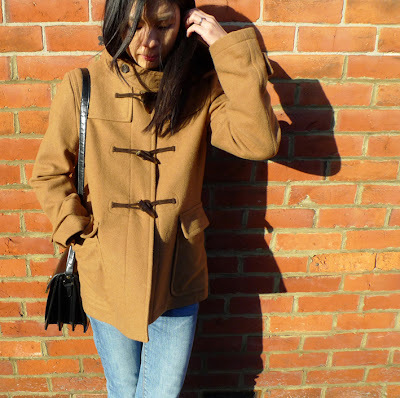 Over the years, I've slowly been building up a wardrobe of coats for all occasions. Parka? Tick. Trench? Tick. Pea coat? Tick. Cape? Tick, tick and tick. 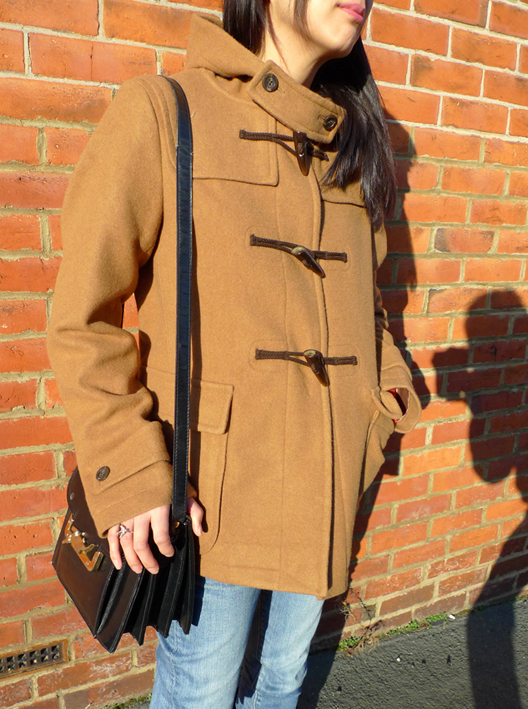 But the style that's been eluding me until now is the duffle coat. Not that it's hard to find, there's been plenty on the high street this winter. It is a classic, after all. In my head, my dream duffle is navy with red tartan lining, not too long, but not too short, and slightly fitted so as to look girlie and cute (as opposed to looking too Paddington Bear). Sonia Rykiel did a great version a few years ago with red toggle buttons and natural cord loops. I've seen a close approximation in Hollister, but it was more than I cared to pay and sold out in my size. No, the store that's got the design of the duffle coat spot-on for me this season is Uniqlo. But, while I admire the men's version, the women's one comes in a blanket-y wool that's more bouclé and textured than smooth and luxe. It wasn't until this weekend, I discovered it does a shorter version of the men's duffle coat for women. Same style, same wool, just lighter on the length and cut for a girl. And in navy! Sadly, despite trekking to four Uniqlo stores across London, I only found the navy duffle in large and extra large. So, the compromise was camel (a little 1970s-retro I'll admit) in medium (slightly larger than I'd like, but it doesn't appear to drown me). Still, the sale price of £39.90 instead of £69.90 made my purchase sweeter. And, as I said before, the design is great. I especially like the throat strap, which buttons out of the way on the side of the hood when not in use. As with the navy version, there are plenty of camel ones in large and extra large, too. Although if anyone spots a navy one in small or medium, do holler! The Uniqlo's men's duffle coat, meanwhile, is worth looking at if you're wanting a longer length. It's reduced from £89.90 to £69.90 with sizes ranging from extra small to extra large. Bear in mind it's not cut for girls, so it's broader in the chest and bigger and longer on the sleeves. But maybe if it drops further in price, it'll be worth the compromise (that's what I was holding out for until I found mine!). I'm so excited - Company magazine has launched its very first Style Blogger Awards and I've been nominated for 'Best Blog for High Street Lovers'! OK, voting is quick and easy: simply choose one blogger from each of the 10 categories that you'd like to see win (you can also vote for me as 'The Blog You Love The Most', too). Plus, for your chance to win £250 of New Look vouchers, enter your email address at the end (although you can omit it if you prefer). And, if you really heart my blog, there's no limit to the number of times you can vote! There are lots of great blogs nominated (and, as with these things, so many more that aren't listed), so look out for your favourites in categories such as Best 'What I'm Wearing Today' Blog, Best 'We Love Vintage' Blog and Best Blog For Crafty Girls. Voting ends on 11th February 2012. On Tuesday I was (unintentionally) working a head-to-toe Sonia Rykiel look, with a sweater from her Sonia by Sonia Rykiel label and shorts from her collaboration with H&M. The perspex cherry brooch was a gift from the Stickman a few years ago. I can't remember who it's by but it's from Magma in Covent Garden, London. 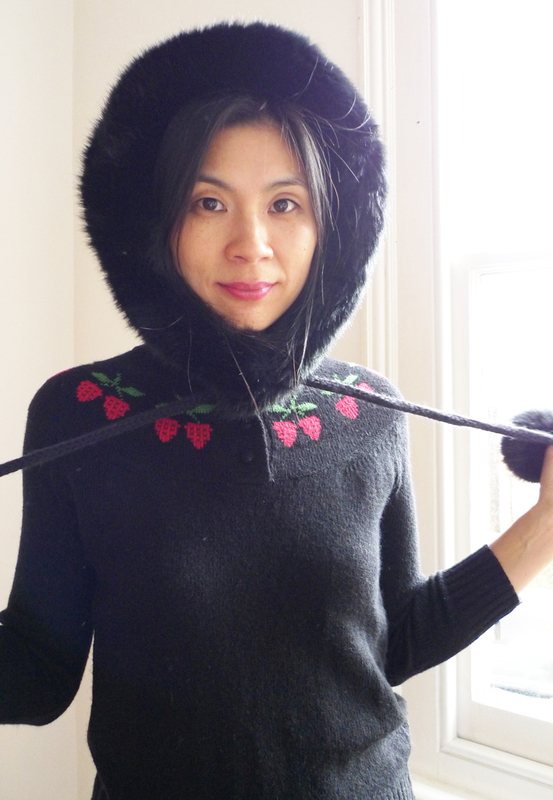 Cherries are such a Sonia Rykiel motif that I always, always wear mine with this particular sweater. If you like cherries, too, you'll love Sonia's cherry 'cherie' T-shirts and sweaters on TheOutnet.com. 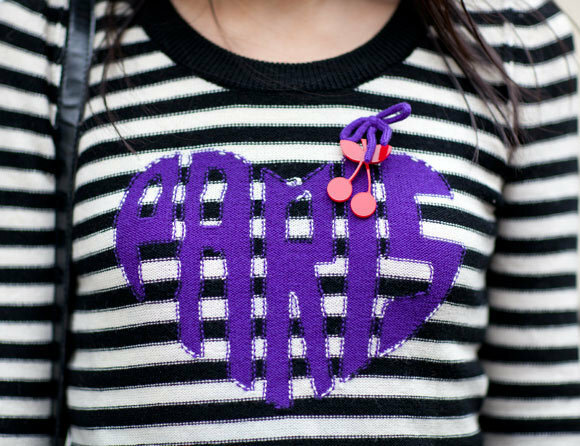 There's also a stripy jumper that comes with its very own cherry brooch. It's a Sonia fest on TheOutnet.com right now, with more than 100 pieces of Sonia by Sonia Rykiel clothing at up to 55% off. What are you waiting for? But before you go, Sonia fans take further note: the sales at Liberty, Matches, style-passport, my-wardrobe, Net-a-Porter and ASOS offer Sonia by Sonia Rykiel at up to 70% off, so there's plenty of bargains to be had. Meanwhile, for more winter fashion inspiration see ELLEuk.com's What ELLE Wears blog. And click here to find out more about my vintage bag (below), too. So, how's your sale shopping going? I had to admit I haven't done very much myself, although I couldn't resist this sweet strawberry yoke sweater by Cooperative at Urban Outfitters. It's so chalet chic, especially teamed with my New Look hat. Plus, it's less than half price at £20, reduced from £48. What's been your best bargain? As you know, I'm a big fan of tba, so after my tba summer sale bargain from ASOS that's the first place I looked during this month's sales. I wasn't disappointed. This tba silk dress is £48, down from £160, while the matching top is a mere £24, reduced from £120. Both come in black or gold. I love the luxurious silk, the fine lace collar and the oversized draped sleeves. An expensive look at cheap prices? I love it even more. This holiday, I've been sofa surfing instead of hitting the shops and this is one of the best bargains I've found. 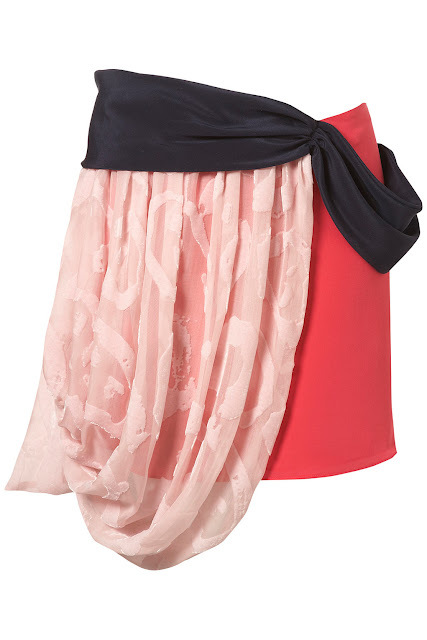 It's a silk and silk devore skirt by Michael van der Ham for Topshop, reduced from £135 to £40. Pay attention: Michael van der Ham is one of the top young London designers to watch. He's worked with Alexander McQueen and Sophia Kokosalaki and his quirky designs, which mix luxurious texiles and patchworks, are stocked in Liberty. Needless to say, his work doesn't come cheap. So, to own a piece of Michael van der Ham for £40 is an opportunity not to be passed over. And, thanks to pieces from his capsule collection for Topshop hitting the sale racks, it's an easy investment to make. You won't regret it when this Dutch designer goes stella. Also look out for Topshop's collaboration with another London designer, Mary Katrantzou, later this year. Another Topshop bargain I spotted (excuse the pun) is the polka-dot devoree pencil skirt. It's very Marc Jacobs and just a tenner, down from £38. And, if my sneak peak of Marni for H&M reveals anything, it's that spots are sticking around. Plus, a pencil skirt is a key skirt shape to work right now. Happy New Year! Before we get on with the business of 2012, what was your Christmas Day outfit last week? Did you wear the obligatory Crimbo jumper? Mine was the winking cat one from River Island. It was £32, but I spied it for £15 in the sale the other day. And, if one festive jumper wasn't enough, I got the cream crocheted sweater for Christmas, too. It's a little bit House of Holland and a whole lot Christopher Kane, don't you think? I like the fact that the bottom two squares are pockets and, it goes without saying, the crocheted-blanket effect is ultimate granny chic. It was £50 from River Island, but I'm sure it'll be in the sale now.